Although Śrī Śrīmad Bhakti Vicāra Yāyāvara Gosvāmī Mahārāja’s forefathers were originally from Orissa, he took birth in Durmuth, Medinīpura District, West Bengal. Śrīla Mahārāja, then known as Śrī Sarveśvara Paṇḍā, was still very young when he encountered Śrī Śrīmad Bhakti Prasūna Bodhāyana Gosvāmī Mahārāja, a disciple of Śrīla Prabhupāda Bhaktisiddhānta Sarasvatī Ṭhākura, in Jagannātha Purī. After hearing the teachings and glories of Śrīla Prabhupāda through Śrīla Bodhāyana Gosvāmī Mahārāja, Śrī Sarveśvara Paṇḍā took shelter at the lotus feet of Śrīla Prabhupāda at Śrī Puruṣottama Maṭha in Jagannātha Purī, and was given the name Śrī Sarveśvara Brahmacārī after receiving initiation. 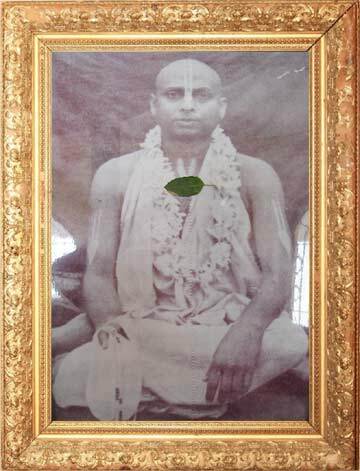 Śrī Sarveśvara Brahmacārī received sannyāsa in 1936 and was the last sannyāsa disciple of Śrīla Prabhupāda. He was given the name Śrīmad BhaktiVicāra Yāyāvara Mahārāja. Śrīla Yāyāvara Gosvāṃī Mahārāja was dūra-darśī—he was able to very clearly see all future happenings. There is one pastime in this regard: In 1960, my Guru Mahārāja, Śrī Śrīmad Bhakti Dayita Mādhava Gosvāmī Mahārāja, organized a festival at our Śrī Caitanya Gauḍīya Maṭha in Vṛndāvana to celebrate the installation of the Śrī Gaurāṅga Mahāprabhu and Śrī Śrī Rādha-Govinda deities, to which he had invited almost all of his godbrothers, including Śrīla Yāyāvara Gosvāmī Mahārāja. Because it was such a large gathering, there was no single location large enough to provide both residence and prasāda to all of the attending Vaiṣṇavas. Various dharmasālās were thus booked, and the arrangements were made in such a way that the Vaiṣṇavas would be able to honor prasāda in their respective dwellings. During the festival, a very young devotee who had only recently accepted sannyāsa spoke hari-kathā. Being quite learned and scholarly, he delivered hislecture in fluent English and quoted many verses from the śāstras. Everyone was impressed to hear such a well-presented lecture. The next day while honoring prasāda, Śrī Śrīmad Bhakti Vikāśa Hṛṣīkeśa Gosvāmī Mahārāja, a sannyāsī disciple of Śrīla Prabhupāda, began glorifying the young sannyāsī who had spoken the previous day. Śrīla Yāyāvara Gosvāmī Mahārāja and Śrīpāda Kṛṣṇa-keśava Brahmacārī were also present in the room. Because I was responsible for providing and serving them prasāda, I too was there. Hearing this praise, Śrīla Yāyāvara Gosvāmī Mahārāja immediately interrupted Śrīla Hṛśīkeśa Gosvāmī Mahārāja by loudly saying, “There is no need to glorify this young sannyāsī at this time. Although he surely spoke hari-kathā nicely, being a new devotee, who can say how much he realizes in hisheart of what he spoke? Speaking is one thing, but how fixed is he on this path? There is much time remaining in his life. Let him first live and grow in this Vaiṣṇava world before glorifying him. Prior to this pastime, I had only known Śrīla Yāyāvara Gosvāmī Mahārāja to be immensely soft-spoken by nature. He was always straightforward and direct, and he spoke whatever he felt. In 1962 during the time of Kumbha Melā in Haridvāra, it was found that the young sannyāsī was not so fixed on the path of bhakti. There, he mixed intimately with women, and this caused him to leave the association of the Gauḍīya Maṭha sādhus. Afterward, he began criticizing everyone. Once, Śrīla Yāyāvara Gosvāmī Mahārāja went to Kālnā while Śrī Śrīmad Bhakti Pramoda Purī Gosvāmī Mahārāja was serving in the Ananta-vāsudeva temple there. When he met with Śrīla Purī Gosvāmī Mahārāja, he said, “You have taken responsibility for this temple as well as different responsibilities at Śrī Caitanya Gauḍīya Maṭha. How can you manage all these things single-handedly? It would be better for you to invest your full time and energy in wholeheartedly serving at only one place.” After accepting his advice, Śrīla Purī Gosvāmī Mahārāja dedicated his full energy to his services at Śrī Caitanya Gauḍīya Maṭha. One day, the brahmacārīs of Śrīla Yāyāvara Gosvāmī Mahārāja’s Śrī Śyāmānanda Gauḍīya Maṭha in Medinīpura became distressed upon seeing that there was no rice whatsoever to cook and offer to Ṭhākura-jī. When they expressed their concern to Śrīla Mahārāja, he immediately understood the situation and consoled them by saying, “Do not worry.” Then, after locking the temple’s gate from inside and keeping the key with him, he turned to the brahmacārīs and ordered them, “Please speak hari-kathā and perform kīrtana for the pleasure of the Lord. There is no need to worry about anything, especially since you are devotees.” After this, he proceeded toward his room on the second floor of the maṭha, where he began to chant harināma loudly. After some time, someone began to knock on the temple’s gate and call out for someone to come and open it, but nobody was able to hear him due to the loud kīrtana the brahmacārīs were performing in the temple hall. Finally, Śrīla Mahārāja noticed from his room that someone was outside the gate. After one kīrtana had finished and before the next started, Śrīla Mahārāja dropped thekeys from the second floor onto the ground floor and instructed one of the brahmacārīs to open the gate and see who had come. When they opened thedoor, they found that the man who had been knocking was standing outside the gate with a giant bag of rice. The brahmacārīs asked, “Has he paid the fare for your rikśaw?” “Yes,” the man replied. Because Śrīla Yāyāvara Gosvāmī Mahārāja was completely surrendered to the Lord, the Lord, seeing the pain Śrīla Mahārāja was experiencing upon being unable to offer bhoga, supplied whatever was needed for this service. His conduct was a testament to his complete surrender to the Lord. In this way, he never worried for anything, and he wanted others never to worry, either. Once, a devotee consulted a doctor regarding an infection he developed from a hand injury he previously sustained. After examining the devotee, the doctor concluded that the only solution was to amputate one of the devotee’s fingers. He told the devotee to return for the surgery after a couple days. Every year just after Gaura-pūrṇimā, many disciples of Śrīla Prabhupāda would visit the maṭha of Śrīla Bhakti Rakṣaka Śrīdhara Gosvāmī Mahārāja in Koladvīpa to meet together and honor prasāda. One year on this occasion, my Guru Mahārāja informed his godbrothers that there was an opportunity to purchase the appearance place of Śrīla Prabhupāda in Jagannātha Purī, and he suggested they purchase the land collectively. Mādhava is in one’s words. Mādhava is in one’s heart. All saintly persons remember Mādhava, the husband of Lakṣmī, the goddess of wealth, in all their endeavors. Upon hearing this, Guru Mahārāja understood that his godbrothers were blessing him by entrusting this service to him. After offering prostrated daṇḍavat-praṇāma to all of them, he gratefully accepted the entireresponsibility of acquiring Śrīla Prabhupāda’s appearance place. After the property of Śrīla Prabhupāda’s appearance place had been purchased, and while the maṭha was still under construction, Guru Mahārāja arranged for a festival to be held there for the occasion of Śrīla Prabhupāda’s appearance day in 1979. He sent out personal hand-written invitations to all his godbrothers that read “Please bless us by attending this festival.” Those who were able to attend arrived on the day of the festival. Because there had been no reply from Śrīla Yāyāvara Gosvāmī Mahārāja, Guru Mahārāja assumed that his invitation had been lost in the mail, and he immediately sent him a telegram. As soon a Śrīla Yāyāvara Gosvāmī Mahārāja received the telegram, he packed a bag and departed for Jagannātha Purī to attend the festivities. Generally, when a guest arrives at his destination, the first thing he wants to know is where he can keep his luggage, where he can bathe and where he will be staying. Śrīla Yāyāvara Gosvāmī Mahārāja, however, was not like this. When he arrived at the festival, the first thing he did was join the kīrtana party. He considered, “Unless and until I do some service here in the maṭha, what right do I have to ask for a place to even keep my bags? Let me first perform service; only then will it be proper for me to request a place to stay.” Such was his service mood. Śrīla Yāyāvara Gosvāmī Mahārāja would offer all his visitors prasāda immediately upon their arrival. Once, he was staying at a place where no musambīs (a type of orange) were locally available, and so a visitor broughtsome from a far distance. Although these fruits were brought especially for him, he at once cut them into slices and offered them to all the devotees present. Such was his personality. Part of Śrīla Prabhupāda’s last instructions to his disciples was for them to collectively preach the message of Śrī Rūpa-Raghunātha. Keeping this instruction in mind, my Guru Mahārāja used to tell his godbrothers, “Somehow, by the will of providence, we are forced to stay in separate places and create different organizations. But in order to fulfill the desire of Śrīla Prabhupāda, we should all meet whenever possible.” In this way, he would invite all his godbrothers each time he hosted functions in our maṭha, providing his godbrothers with an opportunity to speak about the glories and teachings of Śrīla Prabhupāda. 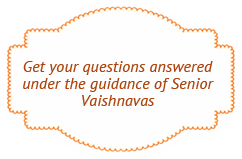 During one such festival, an invited dignitary, a judge named Durgānātha Vasu, who was also the sabhā-pati (chairman), rose from his seat and informed Guru Mahārāja that he had to leave for another engagement. Thus, the sabhā (assembly) would conclude for the night. Guru Mahārāja ordered me to assist the judge to his car and give him some prasāda. After he offered praṇāma to Ṭhākura-jī and the Vaiṣṇavas present, weproceeded to walk together toward his car. In the meantime, Guru Mahārāja had requested Śrīla Yāyāvara Gosvāmī Mahārāja to perform kīrtana, as he did not receive the opportunity to speak due to a lack of time. Abiding by his request, Śrīla Yāyāvara Gosvāmī Mahārāja stood up and began performing a beautiful, transcendental rendition of the kīrtana Nārada Muni Bājāya Vīṇā. By then, the judge was already seated in the car and ready to leave. But upon hearing Śrīla Mahārāja’s kīrtana, he became so mesmerized that he exited the car and returned to his seat in the assembly. Śrīla Yāyāvara Gosvāmī Mahārāja then asked the chairman, a university professor named Śrī Nārāyaṇa Gosvāmī, if he could be allotted more time to respond to the gentleman’s comment. However, Śrī Nārāyaṇa Gosvāmī said, “It is better that I, being a neutral party, comment on his statement.” Addressing the gentleman, he said, “When you use the word jīva in this slogan, to whom does it refer? For Bengalis, the word jīva also refers to the tongue. Does it then mean that you are serving Bhagavān by serving the tongue and giving it whatever it desires? All living entities are called jīvas, not only humans. Why then do the followers of Vivekānanda eat eggs, meat and fish if they are supposed to love all jīvas? “If Vivekānanda’s followers accept that the word jīva only refers to humans, then what is the need for prisons? Should we not close all the prisons and serve all the prisoners whatever they desire, like alcohol, drugs and so on? When the gentleman who objected to Śrīla Yāyāvara Gosvāmī Mahārāja’s kathā heard Śrī Nārāyaṇa Gosvāmī’s explanation, he apologized, admitting hedid not understand the deep meanings of the scriptures and that he was attracted to Vivekānanda’s popular slogans without understanding whether or not they were in line with the scriptures. If Śrīla Mahārāja came to know that a devotee had come from Jagannātha Purī, he would ask him if he had brought any prasāda back with him and where it was. He especially liked Jagannātha’s rice and rāhini-dāl prasāda, which keeps even after two days. Knowing this, as a service to him, we would always bring this prasāda for him when we would visit Jagannātha Purī. He was also an excellent cook. He was expert in finding and using whatever was available to him when he had no ingredients. Once, when he did not have the proper ingredients to make chutney, he saw a tree with leaves and asked, “What tree is this?” When he understood it was a tamarind tree, he made chutney from its leaves. Śrīla Yāyāvara Gosvāmī Mahārāja used to engage everyone in the service of Bhagavān according to their respective qualifications and qualities. If a sannyāsī or brahmacārī were to come to the maṭha, he would tell them to speak hari-kathā. This included me. However, because he was extremely senior to us,we were embarrassed to speak in front of him. Detecting our shyness, he would say, “Do not worry, I will not be present,” and then depart for his room upstairs. Later, he would tell us that he had heard everything we had spoken. He possessed the conviction that one should immediately engage whomever one meets in the service of Bhagavān. Although in truth I did not possess such qualities, he spoke in this way to bless me, so that I one day could. By my Guru Maharaja’s mercy, I had the opportunity to serve Śrīla Yāyāvara Gosvāmī Mahārāja. During the course of this service, I was able to have his association, see his conduct and receive his blessings.